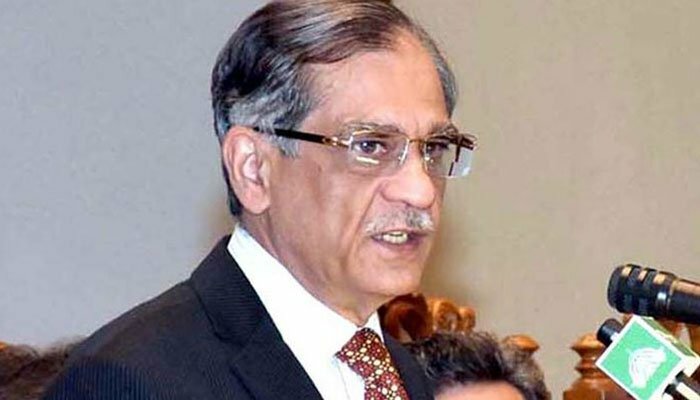 ISLAMABAD: Chief Justice of Pakistan (CJP) Mian Saqib Nisar on Monday reprimanded Federal Minister for Water Resources Faisal Vawda for changing the date set for the groundbreaking ceremony of Mohmand Dam. “You changed the date without informing us and did not even think it was appropriate to tell the top judge. The government does not even have the courtesy to ask the chief justice regarding changing the date, now I might not go to the groundbreaking ceremony,” the top judge remarked during the hearing of a case regarding the construction of Nai Gaj Dam. “The prime minister saw his schedule and changed the date, he did not see that we also have work,” CJP Nisar remarked. “What has the government done till now other than making the announcement that water will finish by 2025? We are collecting funds for you,” he pointedly asked Vawda. In response, the federal minister apologised to the top judge on behalf of the government. “Now tell the prime minister to go inaugurate Mohmand Dam himself,” CJP Nisar responded. “No, you will have to be a part of it. We will invite you for the inauguration and I will request you to come,” Vawda answered. “The prime minister does not know how many matters are pending,” the top judge observed. “The matter has been pending since 2008. If you don’t want to construct this dam then tell us. We took up this case when there were incapable people in power, now the government has qualified and capable people,” he added, while directing that all four chief ministers should appear before the apex court at the next hearing and discuss how the project needs to proceed. The government is expected to approve the project on Thursday. The hearing of the case was then adjourned till Friday. The top judge also presided over proceedings of a case concerning Diamer-Bhasha and Mohmand dams. “The Water and Power Development Authority (WAPDA) is not in contact with us. WAPDA thinks it has gotten independence and will work as it pleases. The Supreme Court will supervise the construction of the dam not the Ministry of Water Resources or WAPDA,” he remarked. “Tell us, when do you want to inaugurate the project and initiate work?” CJP Nisar inquired from the attorney general. “One dam will be built in 2027,” the attorney general answered. “The prime minister said that Pakistan will run out of water by 2025. It is your government and there is no cooperation between institutions,” the CJP observed. “The total estimate of the dam is Rs1,450 billion,” the attorney general informed the court. “Did the government ever think where the money for the construction of the dam will come from? We never said that the dam can be built through funds but that a campaign will start and it has,” the top judge inquired. “Today, a man gave a cheque of Rs1 million. This is the passion with which work is done,” he added. The top judge directed the Federal Board of Revenue (FBR) to evaluate and inform the court if tax could be imposed on mobile phone cards in order to provide funds for the dam. “We had suspended collection of tax on mobile phone cards, while many suggested that the amount could have been utilized in the construction of dams,” he remarked.